Minutes of the previous Meeting held on 10th September 2011: The Minutes were unanimously approved after the omission of a £200 donation to the Jubilee Celebrations, approved at the last Meeting was added. Matters arising (other than those listed elsewhere) Phone kiosk update – PC has bought racking for the shelves. PC and RW will liaise to drill holes in the back board. It is hoped that villagers will support the book exchange. Church notice board – Evelyn Logsdail attended the Meeting and brought a brass plate engraved with the name of Miss Bernice Malson, Lord of the Manor, whose bequest funded the notice board. There followed a discussion on suitable siting for the plate and Councillors agreed to go and look at the notice board before making a decision. SM is to write to Breckland Council once more about the mobile home of Mr I Beckford on Redgrave Road in the hope of getting it removed. Settlement boundary – South Lopham PC has made their submission and are awaiting the final document from Breckland Council. The posts around the Memorial Green have been re-erected. PC has spoken to James Alston about the overgrown hedges in Brick Kiln Lane. Mr Alston will address the matter in due course. The drain on the corner of Church Road was not taking the rain away effectively last weekend. Future rainfall will be monitored. The White Horse PH has been sold to Mr Alan Bailey and is due to open by Christmas as a pub/restaurant. PC raised the problem of accidents on the Redgrave Road with the Council. RSM wrote a letter to the Council about the recent ‘rave’ but received no response. He will send a reminder. Tribute to Alan Howard The Chairman paid tribute to Alan Howard who sadly died recently. He served as a Parish Councillor for 40 years and his great contribution over the decades was much appreciated. Reports from Councillors: Planning SM: There has been a Refusal of Certificate of Lawfulness for Proposed Use or Development received in respect of Fir Trees on Blo Norton Road. It was explained that this is what is applied for if there is a doubt that Planning permission is required. Planning permission is required and we should see the Proposal in the near future. SM will be looking at the plans for that property. Highways PC A complaint from Mr Nibbs has been made about safety re the 30 mph sign on the road into South Lopham from the Diss direction. A memo was sent to Highways and they responded by saying that the sign could not be moved to where there were no homes. PC will be asking Highways to meet with him and RSM to discuss the issue before reporting back to Mr Nibbs. Ideally the 30 mph sign would be sited near Bridge Farm. It was reported that the road in Pooley Street near the garage was falling away. PC will look into this. Community Matters DH. It was reported that the Village Hall hosted the Bonfire Night celebrations and whilst it was an enjoyable event, turnout was a little less than hoped for, thus the event lost about £200. Footpaths RW Nothing to report. Works The litter pick took place on 30th October. A disappointingly low number of helpers turned out but a good job was carried out. The War Memorial will need a clean next year which needs to be budgeted for. The village sign also needs attention and there is some money put aside for that purpose. The Lophams’ Society Granville Horan reported that the Autumn Quiz was well attended and part of the profits will go towards the Jubilee Celebrations. The Society has made a donation of £100 to Lophams’ Link. The next meeting of the Society is Monday 14th November. The Committee needs another member, preferably from North Lopham. There will be a meeting of the Jubilee Committee on 17th November with all groups reporting in. GH, RSM and PC attended a street party workshop held by Breckland Council which was most useful. On Friday 16th December, the annual Christmas drop in will be held from 6pm – 9pm. There will be mulled wine, Christmas fayre, carol singing, Father Christmas and card sales. Correspondence None worthy of discussion by the Meeting. Clerk’s resignation For personal reasons, Lynn Perry has resigned her duties and a replacement clerk is urgently required. RSM is to advertise post again and any applications are most welcome. Mrs Perry was thanked for the work she had carried out for the Parish Council. Other matters There was a short discussion about the Jubilee Woods project. It is hoped that plots of land of approximately an acre in size up and down the country will be planted with trees to mark the Queen’s Jubilee. 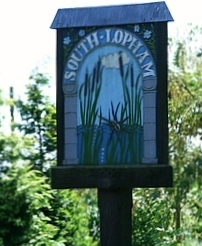 At the time of the Meeting it was not known where such plots were available in South Lopham.